I totally forgot to pick a winner for my Cooper and Me and the Military Giveaway. Sometimes real life gets in the way. The winner is Cristi! pretty easy to choose the winner this time since she was the only one to enter! Am I the only mother to pick her kid's noses? I just can't stand seeing their noses full of gunk. We always blow first, but sometimes you have to be more proactive. We leave for Georgia on Wednesday. Ahhh. Georgia. I love this child and her ability to sleep anywhere. Anywhere except in her own bed after 2:00am. 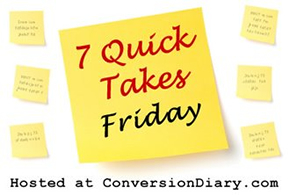 Check out more Quick Takes over at Conversion Diary. Okay, so this one is a little bit of a cheat. But seriously, life around here is rarely calm enough to get this written Friday morning! I totally pick my kids noses. Haven always hated it, so I told her she had to learn to pick her own. Audrey doesn't mind as much as Haven did. There is no way I'm leaving their noses full of gunk, I don't care what society tells us, regular nose picking is just good hygiene. That is the cutest picture of Malcolm ever. Oh my goodness your kiddos are beautiful! I have a little girl that can sleep anywhere too and after 2 a.m can usually be found on my bedroom floor. Followed shortly by her little sister.